Every swimmer knows how the actual act of swimming can be both rewarding and frustrating. I can’t speak how it is for everyone else, but for me most of the time it’s somewhere in the middle, (like most of life). Sometimes the frustration is horrible, getting in the pool unconcerned but then the water feels like it is fighting me on every movement, my (already average) times are down, and I wonder what the hell I am doing wrong. We can mostly remember those days for quite a while. A while back, I was doing repeat 200s when I realised I was doing my repeats 10 seconds faster than normal, and yet it was effortless. There really is no better word. It’s not that I was setting speed records, but I was in a different mental place to normal, which manifested itself as a different physical sensation. I wasn’t even sure when it started, and my first thoughts were that I had been reading the lap clock wrong. I recall an unusual sensation of calmness. I saw the times, was curious, but utterly relaxed, and I didn’t get excited but just stayed calm, without trying too hard. And I held the times. I’ve had good days since then, but not quite as good as that. 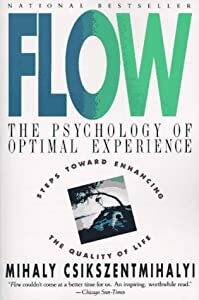 In 1990, Flow: The Psychology of Optimal Experience was published by psychologist Mihaly Csíkszentmihályi, a study identifying a positive state of happiness that arose from the pursuit of expertise. He defines it as: a state of concentration so focused that it amounts to absolute absorption in an activity. 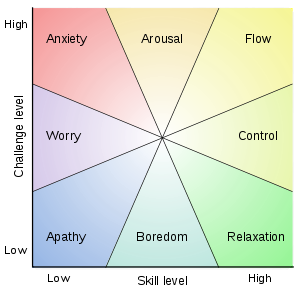 In the article, he identifies the following factors as accompanying an experience of flow. A loss of the feeling of self-consciousness, the merging of action and awareness. Action with awareness fades into action alone. Absorption into the activity, narrowing of the focus of awareness down to the activity itself, action awareness merging. Action with awareness fades into action alone. The author says that not all these factors need to be concurrent for flow to be experienced, but I think, on those rare swimming days, those days that you literally couldn’t pay for, you probably are exhibiting most if not all of the list. In tune, in the groove, flyin’, all are terms we have for the sensation. According to Csíkszentmihályi, Flow state arises as a function of expertise and difficulty, which is ideal for swimmers, who spend years of complete concentration and dedication trying to make minute improvements, (to an extent that non-swimmers don’t realise). When the task is difficult and expertise is brought to bear on it, the flow state can result. Both must match for Flow to result. Now if only the flow state was more readily or regularly accessible. But even if it’s not, the sweet transcendent and rare taste of it, is something that keeps us swimming and pursuing other complex tasks. It’s one of the ineffable rewards of swimming. Two days ago, I FLOWed. It was good. ← St Patrick’s Day post-swim. How To make a great Irish Coffee! Loved the comments and “chase” for the elusive “zone”, a phenomenon so widely experienced yet so uncommonly attained. We understand that outstanding performance occurs in concert with this experience and yet we leave it to chance waiting for the “cosmic tumblers” to fall into place for this joyous experience to occur to us rather than generated by us. I believe, from some level of study into the area that the neurological state (brain waves) of “flow” is the same as that achieved in meditation. We know there are those within our community (Zen Buddhists) that can generate this meditative state at will and so the logical progression is that we should, in theory be able to generate “flow” through some similar form of conscious process as with meditation. If “flow” truly represents perfection of mind and motion together (it sure feels that way) shouldn’t we be investigating its attainment as a community with more vigour rather than accepting it happens to us, not by us? Thanks Ashley, I was surprised, as I am often am, at how popular this post was with swimmers. What surprises me always is how the flow state unveils itself always when I’m not expecting it, there’s definitely a minimum fitness level required for me at least. I love this post, and am honored to have played a small part in inspiring it! I’m constantly baffled by the unpredictability (elusiveness) of these flow days. One day I’ve got it, the next it’s gone. Seemingly little correlation with a good night’s sleep or even a night of moderate drinking. A flow state can arrive in the middle of a workout, after a couple thousand meters of fighting the water. I do notice the frequency of these days is correlated with my fitness (but still unpredictable on a given day). An interesting question is how to deal with the bad days. I think it’s very important to not fight the water. Sometimes I even move down a lane (slower interval) if the interval in my usual lane would mean fighting the water. I focus on stroke length and precise technique. If on a normal day I can hit 1:20s, but today can’t get below 1:25s without fighting – I try to hit those 1:25s as easily as possible. Or I just do something else entirely – kicking, drilling, other strokes, etc. Hi Donal, another interesting book is “Peak Performance – Zen and the sporting zone” by Felicity Heathcote. She was psychologist to the Irish Olympic team in Barcelona, and used meditation, breathing and relaxation techniques in order to focus the mind, avoid distractions and help athletes to get into the zone (effortless action) more easily. The zone is the drug that people chase once they’ve experienced it even once, but of course the harder you try, the further away it seems to go. Perhaps like a lost sock, you can only discover it if you look for something else.. Cheers, Paraic, this post seems to have grabbed a few swimmer’s attention and the elusive theme is common. I’ll look into that book. Cheers Car, being an atheist also, I don’t see the universe in that way either. Give me the second law of thermodynamics anytime. I think I’ll need to do a followup on the four stages of learning, and that flow is most likely to occur once you reached the fourth stage, of unconscious ability, which only results as a consequence of time spent in conscious attempts at mastery. It’s that time spent that drives muscle memory, something swimmers are hyper-aware of when they try to change even one small aspect of a stroke and struggle to embed it in the subconscious. Donal – nice post. More esoteric writers talk about being in the flow of the universe; and they often describe similar perceptual experiences. Being an atheistic materialist I can agree with the analysis, but do thing it shows a commonality of mental experience across activities and cultures. As the flow state is of mind, as well as body. It strikes me that you need muscle memory and a lack of mental distractions to achieve flow. And as others have said it is often on reflection that we realise we were in flow, as many times the immediate (in the present) awareness of flow can take us out of it. It’s a kind of liminal experience. I also find an absence of target also helps (i.e. not thinking I must do 2/5/10k today). Again, as you point out flow state is what a marathon swimmer and other marathoners (e.g. Hurikami’s Art of Running) are easing (rather than straining) for. Great post. I love Csikszentmihalyi’s work, and I think that the elusiveness of flow is intriguing. But I feel like you’ve maybe overstated the role of expertise in the model. My reading of C is that the key element is that there is a match between capability and challenge, and so as long as the swimmer has reached a level of where the movement is incorporated and feels ‘natural’ and unthinking, flow is an accessible state. Even inefficient plodders have flow days, as long as the movement is ingrained and the challenge matches those capabilities – which is a delightfully egalitarian thought. Also, although it does sometimes coincide with / facilitate an exceptional performance (as with your impressively speedy 200’s), C notes that it often doesn’t – that the satisfaction of it lies elsewhere, which is part of what makes it so intangible. For me, after months of drilling and concentrating on my stroke, the immediate possibility of a flow state is miles away (strategically purposeful refusal to merge action and awareness into action only). But I live in hope for the summer now that I’ve started swimming (as opposed to mostly drilling) again… As Evan says, those are the days that we live for. Glad you like it Karen. I guess by expertise here, what I meant was not how good someone is, otherwise us mortals wouldn’t achieve flow, but a function of the time dedicated to the pursuit, which allows us to feel more in tune, which is I think what you are also saying. John Jerome called it an “opening up” of the swimming stroke. Instead of everything happening too quickly to analyse, with the time spent, you can slip more into the moment and movement and enjoy it. I’ll to have a look at it later to edit it for clarity. Yeah – I think I got tripped up on the term “expertise”, but I definitely agree that it’s about time spent doing the activity (in order to incorporate the movements), regardless of ‘level’ achieved.